The promise of computerized practitioner order entry (CPOE) to improve patient safety has depended in part on the implementation of clinical alerts at the point of care. A pivotal 1998 article in The Journal of the American Medical Association showed that CPOE was associated with a 55% reduction in adverse drug events, a finding that contributed to the technology being recommended in the influential Institute of Medicine publication, To Err Is Human: Building a Safer Health System. This work and others prompted purchaser groups such as Leapfrog to add CPOE with decision support to their scorecard in order to provide health care organizations and technology vendors with an incentive to include order checking in commercial EHR systems. Fast-forward 15 years to the post-ARRA world, in which the majority of US hospitals and clinics are using EHRs and entering orders using CPOE. Now, providers are frequently alerted to various drug-drug, drug-patient, and guideline-based recommendations during the ordering process. Some studies report that approximately 3% to 6% of orders create alerts, which, in turn, create dozens of daily interruptions for busy clinicians. It's clear that the promise of CPOE with decision support has not been fully achieved, due in part to "alert fatigue." Practitioners override alerts up to 95% of the time, with as much as 30% of critical alerts being ignored. There's even evidence of a culture of outright ignoring alerts, including case studies that chronicle situations in which alerts for harmful orders are missed because of the high frequency of less important alerts. What are the reasons behind such dangerous oversights? Watch over the shoulder of a practitioner placing orders using a commercial EHR and observe the alerts targeted for older patients with renal impairment when the patient at hand is actually young with healthy kidneys. During the same ordering session, observe the alarm for a drug-drug interaction for a medication the patient has long since stopped taking or that's being discontinued. See alerts appear for allergies that are actually predictable, temporary side effects that the practitioner and patient previously decided were lower risk than the condition for which the drug is being prescribed. See the same alert appear several times to the same practitioner in a single morning session, each time overridden with growing frustration and grumbling: "Aren't these computers supposed to help? Aren't they smart enough to know the basics?" It seems that the formulas behind the alerts rarely integrate the patient's history, laboratory results, context of care, and prior experience with medications. Studies investigating the causes of alert fatigue haven't identified a single source of the problem. In a systematic review of point-of-care alerts, a 2010 study found that the alerts had little to no effect compared with earlier pioneering studies. More importantly, the authors were unable to identify predictors of success. Several psychological explanations are possible, but none have been directly addressed. The impacts of interruptions on the psychology of attention and situational awareness are relevant. Alerts may not match the timing of the decision-making process, providing information after the decision has been made and not during the real deliberative process. An alert that distracts the provider from the larger focus may actually decrease situational awareness and increase errors. Alerts may not properly target the team member responsible for a task, causing diffusion of responsibility. Finally, the systems transmitting alerts aren't designed to consider whether they have been previously overridden by the same practitioner in the same circumstances. How might the goal of safe ordering be achieved without deluging providers with alerts they regard as a distraction? The solution likely will require a deeper dive into the psychology and human factors associated with EHR design. Computerized decision support design must be based on a better understanding of how humans think, work, and process information. There are several possible ways to construct a better alert system. The best way computer systems can contribute is to minimize, not increase, the cognitive load on providers. Passive displays of evidence-based information that appear with patient-specific data on the same screen can be absorbed in a noninterruptive process. Clever approaches include prompting the selection of patient-specific, nonallergic antibiotics and providing important patient preferences as well as suggestions to guide patient discussions. No alert need appear, and the information on medication choices is available at the beginning of the decision-making process—when attention is on those issues—as opposed to during order entry. Once orders are laboriously entered, the motivation to sign and go on to the next task is substantial. Twenty-eight years ago, a paper appearing in the Annals of Internal Medicine proved how it's possible to avoid unnecessary test ordering. When a test is about to be ordered, the right hand of the screen displays the results (if any) of the same test in reverse chronological order. In this format, it's effortless to see prior results. The clinician can quickly determine whether prior results are sufficient for the clinical need. In this case, no alerts are necessary, which, of course, eliminates alert fatigue. Despite this simple approach reducing test-ordering charges by 13%, it's not yet broadly adopted. The history of both the patient and the ordering clinician with a particular drug must be taken into account. Moving many alerts from interruptive to passive displays contingent on expertise and context would customize the ordering experience without losing patient safety benefits. Alerts must be integrated into care pathways and team-based interventions. By tailoring who receives the alerts and when they appear during the care process, workflow will improve and the responsibility to attend to the alerts will be better specified. 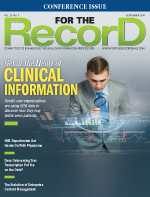 Many organizations using EHRs have enjoyed great success with computerized decision support. The number of patients hospitalized with blood clots has decreased, Foley catheters are being removed sooner, and blood transfusions are ordered when necessary and not before. These accomplishments often involve carefully crafted workflows analyzed by clinically savvy multidisciplinary teams. These examples provide proof that there is a way to make CPOE more effective. Review recommendations from CPOE and clinical decision support pioneers and apply those lessons to your organization. Curtailing alarm fatigue involves a total team effort, from bedside clinicians, informaticians, and cognitive specialists to EHR vendors, policy makers, and patients. — Thomas Payne, MD, FACP, is the medical director of IT services at UW Medicine in Seattle and board chair-elect of AMIA. — Charlene Weir, RN, PhD, is a professor and a cognitive scientist in the department of biomedical informatics at the University of Utah and associate director of the VA IDEAS (Informatics, Decision-Enhancement and Surveillance) Center of Innovation at the Salt Lake City VA.
Bates DW, Kuperman GJ, Wang S, et al. Ten commandments for effective clinical decision support: making the practice of evidence-based medicine a reality. J Am Med Inform Assoc. 2003;10(6):523-530. Bates DW, Leape LL, Cullen DJ, et al. Effect of computerized physician order entry and a team intervention on prevention of serious medication errors. JAMA. 1998;280(15):1311-1316. Bryant AD, Fletcher GS, Payne TH. Drug interaction alert override rates in the Meaningful Use era: no evidence of progress. Appl Clin Inform. 2014;5(3):802-813. Carspecken CW, Sharek PJ, Longhurst C, Pageler NM. A clinical case of electronic health record drug alert fatigue: consequences for patient outcome. Pediatrics. 2013;131(6):e1970-e1973. Endsley MR, Garland DJ, eds. Situation Awareness Analysis and Measurement. Mahwah, NJ: Lawrence Erlbaum Associates; 2000. Gollwitzer PM. Mindset theory of action phases. In: Van Lange PAM, Kruglanski AW, Higgins ET, eds. Handbook of Theories of Social Psychology, Volume 1. London: Sage Publications; 2012:526-545. Institute of Medicine, Committee on Quality of Health Care in America; Kohn LT, Corrigan JM, Donaldson, MS, eds. To Err Is Human: Building a Safer Health System. Washington, DC: National Academy Press; 2000. Li SY, Magrabi F, Coiera E. A systematic review of the psychological literature on interruption and its patient safety implications. J Am Med Inform Assoc. 2012;19(1):6-12. Shojania KG, Jennings A, Mayhew A, Ramsay C, Eccles M, Grimshaw J. Effect of point-of-care computer reminders on physician behaviour: a systematic review. CMAJ. 2010;182(5):E216-E225. Slight SP, Seger DL, Nanji KC, et al. Are we heeding the warning signs? Examining providers' overrides of computerized drug–drug interaction alerts in primary care. PLoS One. 2013;8(12):e85071. Tierney WM, McDonald CJ, Martin DK, Rogers MP. Computerized display of past test results: effect on outpatient testing. Ann Intern Med. 1987;107(4):569-574.